Sleepwalking has been described in medical literature since before the time of Hippocrates (roughly 460-370 B.C. ), thus providing us with extensive case studies and overall knowledge of the disorder. Sleepwalking has also been portrayed in art and culture ­ all the way from Shakespeare (17th century) to Step Brothers (2008). In Shakespeare's Macbeth, Lady Macbeth's sleepwalks because she is haunted by the past and the scene of her sleepwalking is one of the most recognized of the play. In the movie Step Brothers, both brothers (played by actors Will Ferrell and John C. Reilly) sleepwalk at night. Lastly, the most common myth about sleepwalking is that those affected walk with their arms stretched out in front of them (see image on front panel). This is NOT true. Sleepwalking is a sleep disorder that belongs to the "parasomnia" family. 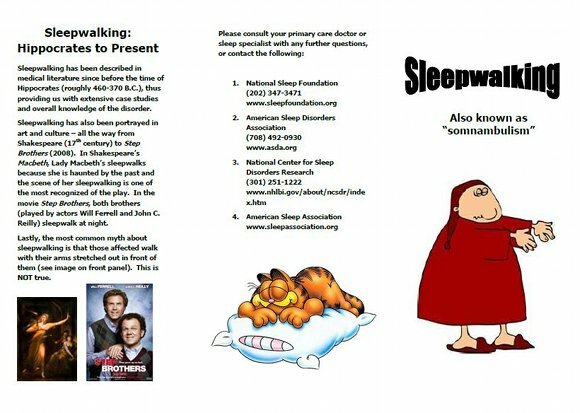 Sleepwalkers arise while they are sleeping (generally within the first third of the night during the slow wave NREM sleep stage) in a state of low consciousness and perform activities usually performed during the day. Sleepwalking is usually harmless with the majority of cases involving activities such as sitting up in bed, walking around the house, or cleaning up. However, sleepwalking can also include things like cooking and driving, which become extremely dangerous due to the low state of consciousness of sleepwalkers. On rare occasions, sleepwalkers have committed violent acts to themselves and/or others, occasionally resulting in death. Though their eyes are open, you can tell a person is sleepwalking from the glassy, staring expression on their face. Their responses to questions, if any, are usually slow and often do not make sense. Sleepwalking events typically range from one to five minutes in their duration, but can last up to a half hour. Upon waking, sleepwalkers tend to have little or no memory of the event, as they were not fully conscious when it occurred. 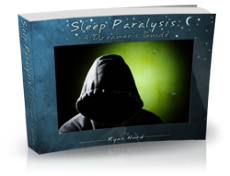 According to the National Sleep Foundation, sleepwalking is present in 1-15% of the general population. It is most common in children 4-8 years old and the events tend to decrease with age and disappear by adolescence. The persistence or onset of sleepwalking in adults is much less common than in children, but when it does occur, the events happen three times more often per year and last for more years than in children. Sleepwalking is extremely rare in old age, and if it occurs, is usually indicative of another disorder. Heredity is a large factor in sleepwalking and the disorder tends to be clustered in families. Specifically, children are 45% likely to be affected if one of their parents was affected and 60% if both were affected. 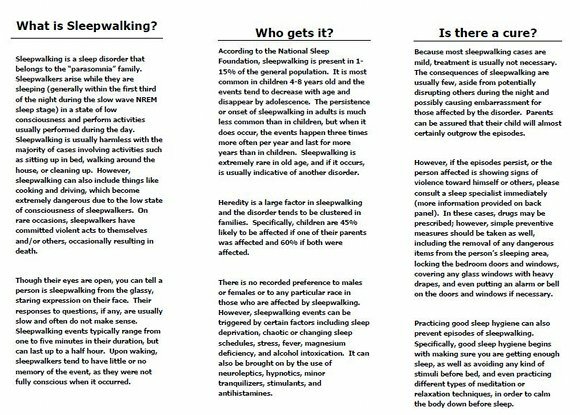 There is no recorded preference to males or females or to any particular race in those who are affected by sleepwalking. However, sleepwalking events can be triggered by certain factors including sleep deprivation, chaotic or changing sleep schedules, stress, fever, magnesium deficiency, and alcohol intoxication. It can also be brought on by the use of neuroleptics, hypnotics, minor tranquilizers, stimulants, and antihistamines. Because most sleepwalking cases are mild, treatment is usually not necessary. The consequences of sleepwalking are usually few, aside from potentially disrupting others during the night and possibly causing embarrassment for those affected by the disorder. Parents can be assured that their child will almost certainly outgrow the episodes. However, if the episodes persist, or the person affected is showing signs of violence toward himself or others, please consult a sleep specialist immediately (more information provided on back panel). In these cases, drugs may be prescribed; however, simple preventive measures should be taken as well, including the removal of any dangerous items from the person's sleeping area, locking the bedroom doors and windows, covering any glass windows with heavy drapes, and even putting an alarm or bell on the doors and windows if necessary. Practicing good sleep hygiene can also prevent episodes of sleepwalking. 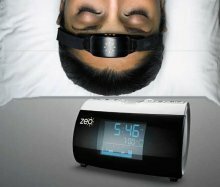 Specifically, good sleep hygiene begins with making sure you are getting enough sleep, as well as avoiding any kind of stimuli before bed, and even practicing different types of meditation or relaxation techniques, in order to calm the body down before sleep.